It may come as a real surprise to many Canadians but we have never been a strong economy. From the standpoint of most of the world we barely even register as an economic force. Yet a combination of global events have conspired to make Canadians far more comfortable with a greater sense of complacency about the tenuous position of Canada’s economic might. Don’t get me wrong. It’s not that Canada and Canadians aren’t wealthy. We are. But having a high standard of living is largely a result of forces that have been as much beyond our control as any particular economic decisions we’ve made. Consider for a second the size of Canada’s economy in relation to the rest of the world. While we may be one of the G8 nations, the Canadian economy only accounts for about 2-3% of the global GDP, and has (according to the IMF) never been higher than the world’s 8th largest economy. Even with the growth in the oil fields Canada hasn’t contributed more than 2.8% to global growth between 2000 and 2010. The Rise and Fall of Nortel Stock. It’s not just that Canada isn’t a big economy, we’re also a narrow one. In the past we’ve looked at how the TSX is dominated by only a few sectors, but the investable market can play even crueler tricks than that. If you can remember the tech boom and the once great titan Nortel, you might only remember their fall from grace, wiping out 60,000 Canadian jobs and huge gains in the stock market. What you should know is that as companies get bigger in the TSX they end up accounting for an ever greater proportion of the index. At its peak Nortel accounted for 33% of the S&P/TSX, creating a dangerous weighting in the index that adversely affected everyone else and skewed performance. Similarly much of Canada’s success through the 90s and early 2000s had as much to do with a declining dollar. While it may be the scourge of every Canadian tourist, it is an enormous benefit to Canadian industry and exports. 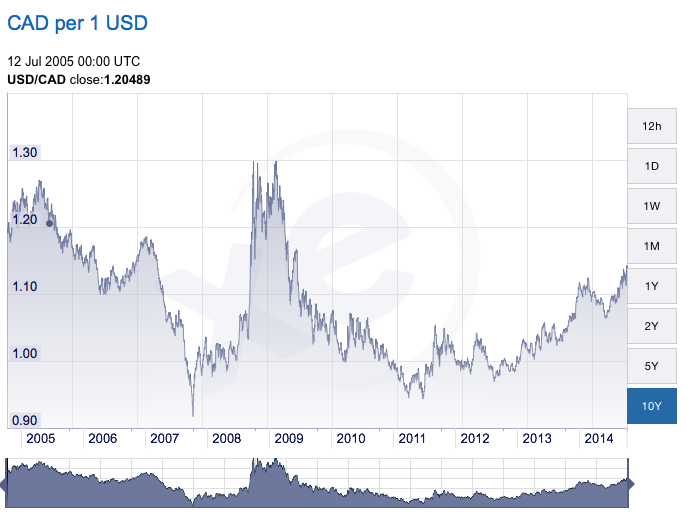 Starting in 2007 the Canadian dollar began to gain significantly against the US dollar. This sudden gain in the dollar contributed to Canada’s relative outperformance against every global market. The dollar’s rise was also closely connected to the rise in the value of oil and the strong growth in the Alberta oil sands. This mix of currency fluctuations, oil revenue and narrow investable market has created an illusion for Canadian investors. It has created the appearance of a place to invest with greater strength and security than is actually provided. Some studies have shown that the average Canadian investor will have up to 65% of their portfolio housed in Canadian equities. This is insane for all kinds of obvious reasons. Obvious except for the average Canadian. This preference for investing heavily into your local economy has been coined “home bias” and there is lots of work out there for you to read if you are interested. But while Canadians may be blind to the dangers of over contributing to their own markets, it becomes obvious if you recommend that you place 65% of your money in the Belgium or the Swedish stock market. However long Canada’s relative market strength lasts investors should remember that all things revert to the mean. That’s a danger that investors should account for.